Wild deer can usually survive on what they find in the forest or their natural habitat. Depending on the season, they can eat grass, soft twigs and leaves, nuts, and whatever fruit their tongues can reach. Deer also like eating mushrooms and even wild flowers! 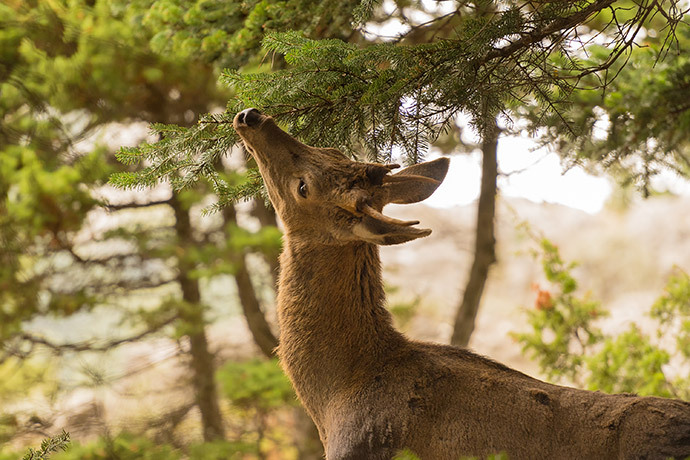 To help nature replenish its sources and supply deer with more food, some deer managers and landowners revegetate forests and hunting areas, meaning they plant grasses, shrubs, trees, and other naturally growing plants. Some deer managers and hunting ground owners also use food plotting to feed deer in their lots. As explained by New York Antler Outdoors, food plotting consists of planting legumes and forage grasses that have higher nutritional value than what is found in a natural setting. Doing this attracts more animals and therefore increases the potential harvest in one’s hunting grounds. North American Whitetail claims that deer prefer to eat nuts the most. Chestnuts are usually their favorite, but they also eat pecans, hickory nuts, and a wide variety of other nuts. I’ve noticed that chestnuts, in particular, are popular among deer, most likely because they are rich in carbohydrates and protein. Deer also like eating acorns, especially those from red oak and white oak trees. Acorns are rich in carbohydrates and essential fats that deer need to stay active. Most deer prefer chestnuts over acorns though because acorns may sometimes cause indigestion. Deer often need to eat lots of nuts during autumn because they need more carbohydrates in their bodies. Nuts allow them to stay more active in cooler weather and keeps their internal temperature higher, allowing them to stay warmer for longer periods. Available all year round are shrubs and young trees with soft leaves and twigs that deer can munch on. These also include fallen leaves and twigs, which the deer can simply eat off the forest floor. While these may not be a deer’s favorite meal, they provide ample nutrition especially during late autumn and winter, where other food sources become scarce. Grass shoots and certain weeds are highly digestible and are rich in antioxidants and other minerals that deer need. However, they cannot survive winter temperatures and would only start to sprout again in early spring. Deer take advantage of this and eat them in mouthfuls in order to replenish the nutrients and regain the weight they lost during winter. Eating young grass also supplies them with the energy they need to survive another change in season. 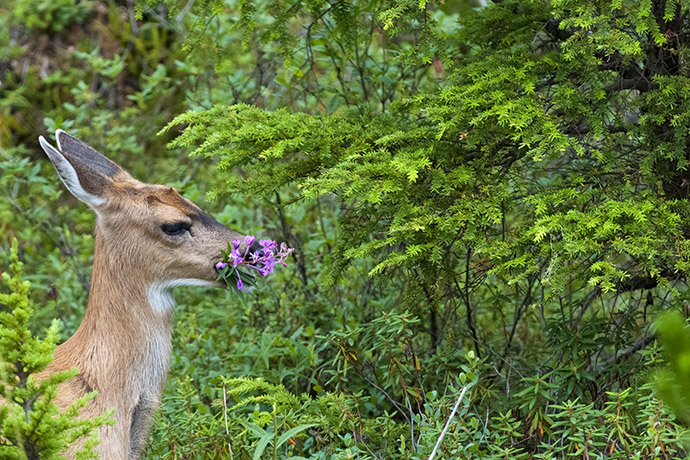 Deer love wild flowers, such as roses and dandelions. It is not uncommon to see deer going out on fields and meadows covered in wild blooms to forage there. They also love poison ivy and are not affected by the toxins that irritate a human’s skin. They also like eating non-wood perennials like white clover and alfalfa. Clover usually comes out in early spring and last until summer, and then grows back in autumn until the beginning of winter. Alfalfa, on the other hand, can usually survive winter, making it a vital food source for deer. Deer need carbohydrates and sugar to sustain their activities throughout the day, and fruits are a rich and delicious source of both. Deer love munching on apples, grapes, plums, persimmons, and a variety of berries like mulberry and blackberries. Many of the fruits that deer eat grow in the wild, but it is not impossible for deer to approach the edge of orchards to eat fruit on the ground, as long as they feel that they’re safe in the area. While deer may eat fruits all year round, they usually rely on this food source to provide them the extra energy they need during autumn. 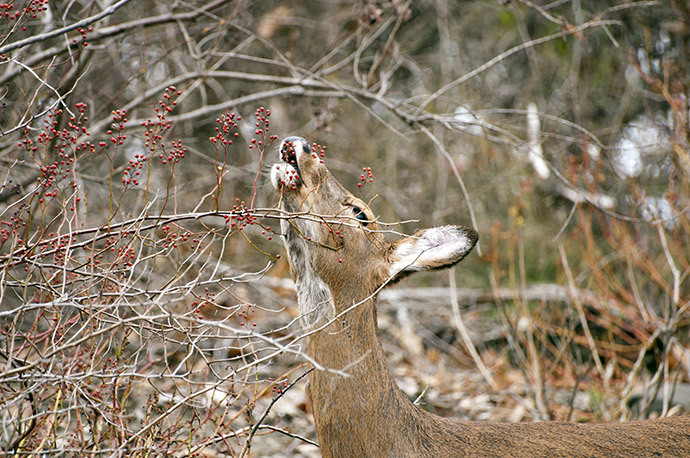 Sugars and carbohydrates from fruits also help deer store fat for the long winter ahead. It may come as a surprise to some, but deer actually love to add mushrooms in their diet. When you spot a deer near a fallen log or tree stump, there’s a likely chance that it is eating some species of mushroom. Because they are immune to mushrooms that may be poisonous to humans, deer don’t have to be that careful when eating mushrooms they find in the forest floor. Deer don’t just like how mushrooms taste, they also need it because it is a primary source of phosphorus. Phosphorus helps deer grow strong and healthy antlers, and does (female deer) need it to provide nutrition to their fawns. Knowing what deer eat at which time of year not only help increase your chances of catching game, it may also allow you to enjoy your hunting experience better. 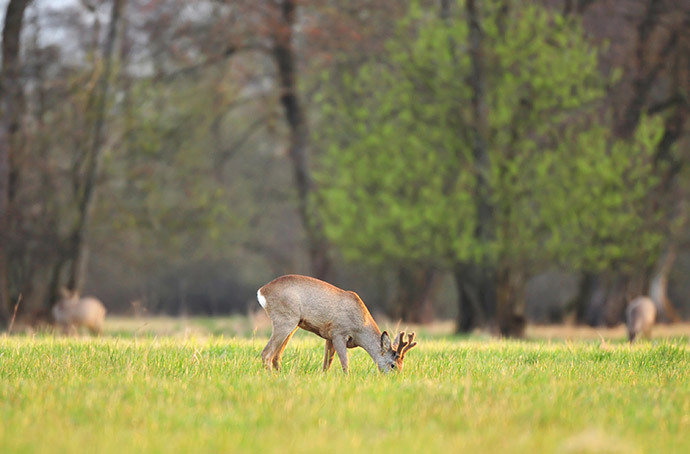 Take the time to learn which plants and forage are available in your hunting region and consider this when looking for a spot to set up your hunting stand or blind. Did this list help? 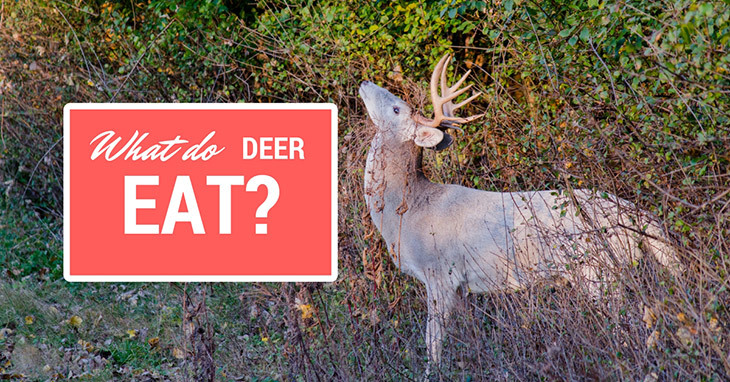 Do you know what other foods deer love to eat? Share them in the comments’ section below. I’d love to hear them!